Madhya Pradesh Professional Examination Board (MPPEB) has been announced for the MP Vyapam Jail Prahari various posts notification. MP Vyapam Jail Prahari released an advertisement for the various posts of Jail Prahari. All eligible and qualified applicants can apply online application form 11/08/2018. Appliers have to seek online application who wants to grab this opportunity Online application form filling procedure has been started from 11th Aug, 2018 and will close on 30th August, 2018. Interested and eligible applicants may apply for MP Vyapam Jail Prahari Notification 2018 through online made. Candidates, who have Higher Secondary Examination (12th Passed) from MP Secondary Educational Council or equivalent recognized institute, may apply for MP Vyapam Jail Prahari Notification 2018. Contenders must visit the site and fill the form on or before the last date. Read the below given session for more info like educational requirement, age limit, relaxation in age, pay scale offered, selection procedure etc. Rs. 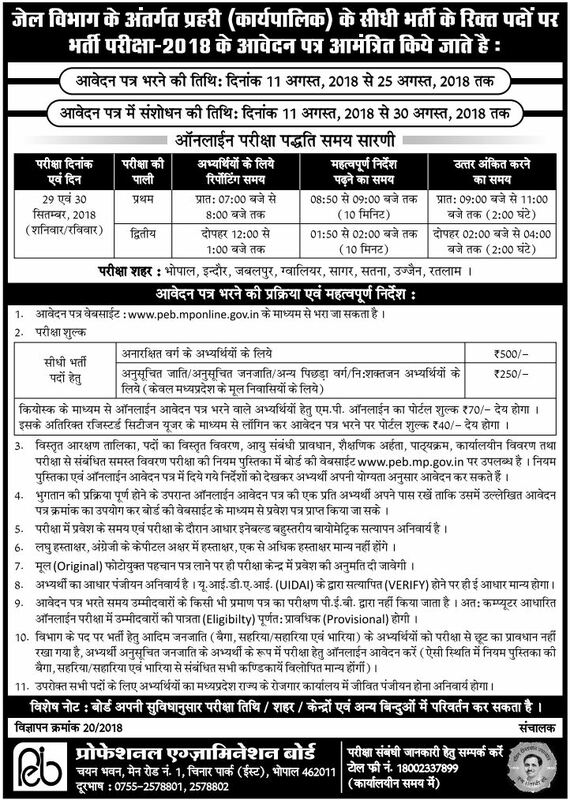 250 for OBC/SC/ST candidates and Rs.500 for UR candidates. Fill the details in the application form and upload your recent image and signature.